Product #60704 | SKU OR-25 | 0.0 (no ratings yet) Thanks for your rating! Designed to hold small cameras, and is well padded and has 5 giant external pockets to store more accessories. 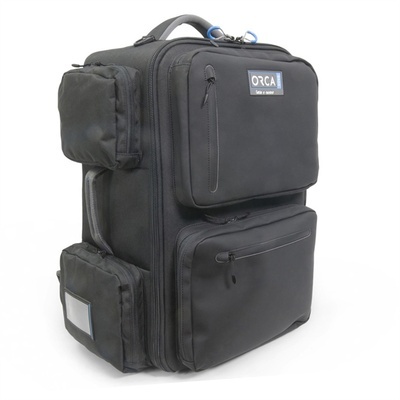 The Orca OR-25 Backpack with Large External Pockets is designed to hold small cameras such as: Sony PXW -X280, FS-7, FS7K, Panasonic: EVA 1 fully equipped, Mini Alexa fully equipped, URSA, JVC-AG-HM -850U and similar size cameras. The bag is well padded and has 5 giant external pockets to store more accessories. The backpack system is well ventilated and padded to hold high weight. The outside of the bag features a padded carrying handle, and two buckles to allow connection of a shoulder strap if needed (shoulder strap is not included), as well as a bungee cord system to secure a small tripod. Inside the bag, there are divider sets to help the user to set the equipment in the way that you want. There is also a laptop padded pouch for 17″ laptops.